This is the last of the New Forest brushes to be made competely by hand in China. All new brushes will have handles made in the New Forest in the old traditional way using hand tools to shape the handle on a lathe. The hair used in the making of these brushes comes from a rare species of badger found only in remote mountain areas of China. It is amazingly soft and provides a luxurious shaving experience. The knot is 22 mm and has a loft of 47 mm and the handle height is approximately 50 mm. 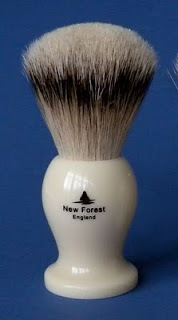 The price of this brush is £45 including worldwide delivery. No other brush with this hair quality is remotely near this price. Payment of £45 is by paypal to NFB@padh.co.uk. It will be shipped within one working day. Here are the first impressions of some of my early customers! "Oh man...the NF High Mountain is one fantastic brush! It must be said, it is FINE for facelathering hard soaps (MWF, Harris, Speick, Valobra etc), no problem at all. Just load the brush for a wee bit longer than with a stiffer brush. This thing is just pure luxury! The only problem is that it creates lather so fast, I don't need to keep swirling it on my face even though I want to! For the price of this brush, compared to $450 for a comparable Plisson, it MUST be considered for the "deal of the century" award! La calidad de estas brochas son excepcionales, la mia es muy suave, no perdido ni un solo pelo y es la brocha con la que más satisfacción he encontrado a la hora del afeita. En mi caso la altura era de 48mm. El servicio rápido y eficaz. 100% recomendado. The quality of these brushes are exceptional, mine is very soft, not lost a single hair and brush with which I found more satisfaction at the time of shaving. In my case the height was 48mm. The fast and efficient service. 100% recommended. Thank you Carlos. Your feedback is appreciated. Oh man...the NF High Mountain is one fantastic brush! It must be said, it is FINE for facelathering hard soaps (MWF, Harris, Speick, Valobra etc), no problem at all. Just load the brush for a wee bit longer than with a stiffer brush. This thing is just pure luxury! The only problem is that it creates lather so fast, I don't need to keep swirling it on my face even though I want to! For the price of this brush, compared to $450 for a comparable Plisson, it MUST be considered for the "deal of the century" award! Thank you Neil - I really enjoy my brush too! Email me at NFB@padh.co.uk and I will send information. Regards, Peter. Fido, this brush is worth a review. Thank you very much for such wonderful brushes.